Mother London has cooked up Chipotle's first British campaign with print ads and posters that explain how to pronounce the burrito chain's name. 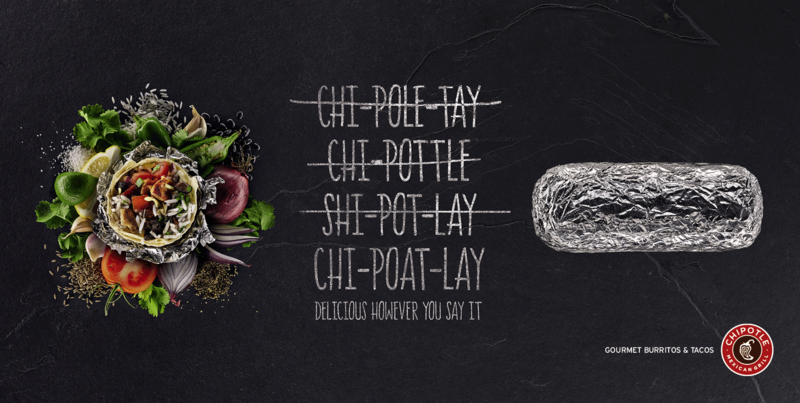 "Chi-Pole-Tay," "Chi-Pottle" and "Shi-Pot-Lay" are wrong. (Now they tell me. All those wasted years.) "Chi-Poat-Lay" is correct. Thanks, Chipotle! "Delicious however you say it" is the tagline. Hey, thanks again! Cue "Farmed and Dangerous." Crank up Willie Nelson. Now, Brits can rest assured they've got the name right and savor that addictive, gut-grinding Chi-Poat-Lay bliss as the sun sinks yet lower on their once-mighty empire.